Causeway Link CW6 is a cross-border service operated by Malaysian bus operator Handal Indah (Causeway Link), plying between Giant Nusa Bestari and Boon Lay in Bukit Indah, Malaysia. Crossing the border via the Tuas Second Link, the route supplements CW3 for the popular Singapore – Bukit Indah sector. Departure Times from Giant N.B. 10 – 30mins. Approximate frequency of 15 – 25mins throughout most of the day. 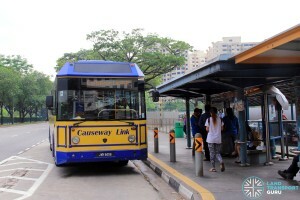 Service CW6 is a cross-border route connecting the Taman Bukit Indah area within Johor with Boon Lay in Singapore, via the Tuas Second Link crossing. 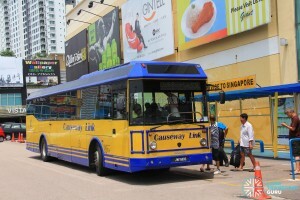 The route is one of five regular cross-border bus services operating via the Tuas Second Link, along with Service CW3, CW4, CW4S and CW7, and the only one to serve Boon Lay. The boarding and alighting point of this route at Boon Lay is an abandoned bus stop along Boon Lay Way, near Boon Lay MRT Station. CW6 is currently the only regular bus service to call at the stop. 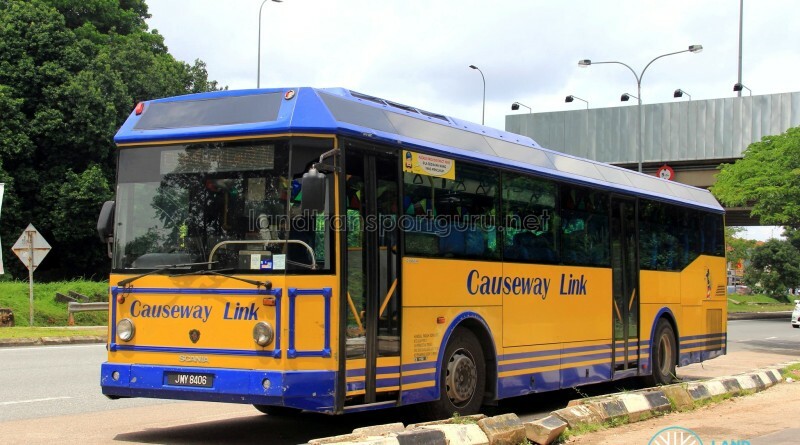 Second Link plying CW services, inclusive of CW6, operate as a local bus while operating within Johor, hence serving at all en route bus stops. They do not stop at any bus stops in Singapore except the designated boarding point at Boon Lay. Due to varying traffic conditions at the Tuas Second Link, travel times and waiting times may increase significantly when traffic congestion occurs. Giant Nusa Bestari: Sheltered waiting area outside Giant Nusa Bestari main entrance. At each checkpoint on the Singapore and Malaysian side of the border, passengers will have to alight and clear customs before boarding the bus again. 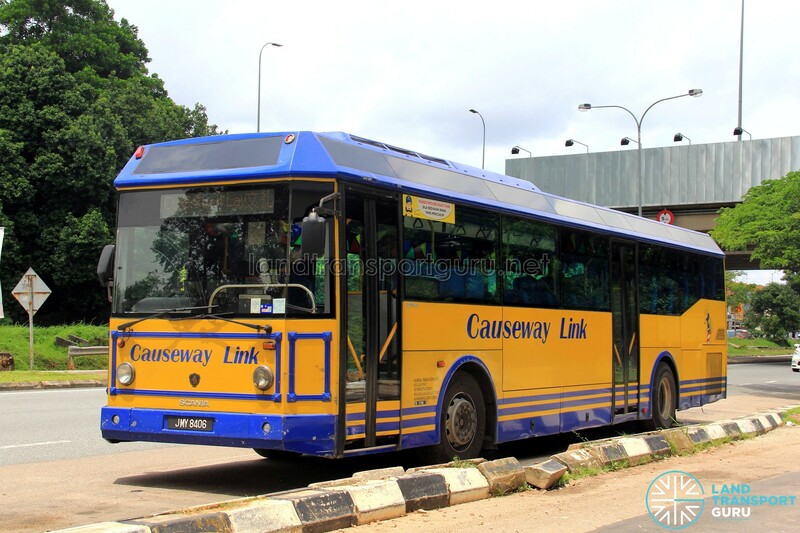 When travelling between Tuas CIQ Complex and Sultan Abu Bakar CIQ Complex (“CIQ 2nd Link”) in either direction, commuters may board any Causeway Link bus (Service CW3, CW4, CW4S, CW6) with a valid ticket. Commuters using the ManjaLink Card should tap their card upon entry. With a valid ticket at Tuas Second Link, passengers travelling towards Jurong East can similarly board CW3, CW4 or CW4S to Jurong East (or CW7 to Tuas Link) as the fare is the same. 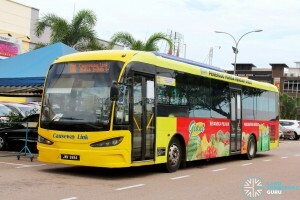 Alternatively, passengers heading towards other destinations in JB can transfer to other bus services at CIQ Second Link. The timetable is published as a general guide to service levels provided and is subject to inaccuracies. Note: Green denotes roads in Singapore, Blue denotes roads in Johor Bahru, Malaysia. This has been happening so many times. CW from tuas to boonlay is always so late!!!!! CW to jurong east mostly came more then 5, and not even one CW to boonlay. Please do something about it!!!! Your service is so dissappointing!!!! Just wanna confirm about CW6, can the bus stop at AEON Bukit Indah? I don’t know why there is no feedback section with regard to services provided by CW6? The operator shall regularly review the possibility to offer a reasonable and acceptable standard to passengers. Through many personal experiences and observation, buses had never intended to wait for passengers (even a tiny 5 mins) will be tremendously helpful. I really pity those waited at immigration station (both Sg and JB) for hours and hours and would be pleased to see if any of CWS’s management staff to experience themselves for the services they provide to public. Be responsible please.